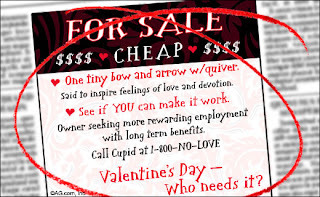 Here are some great graphics for the Anti-Valentine Dayers, like myself. So here’s to a Happy Valentine’s Day! Now it’s time to eat chocolate! How to receive a compliment? I love compliments just as much as anyone else. And I do my best to take them graciously. Over the course of the last year I have received more or less the same compliment from numerous people, some of whom I barely know and barely know me. It goes something like this, “Courtney, you have a kind, gentle heart. You are a very nurturing person and someday you will make a great mother. You know how to be stern but compassionate at the same time. You are always taking care of people and things, and you do it well.” How do I take that? Me, I see my life slipping away for that opportunity. Yea, sure, I’m only 26 almost 27. BUT! I’m no where near dating anyone right now. I’m no where near becoming someone’s mother. So, how do I accept those compliments? Well, I thank them of course, as tears well up in my eyes and I try not to show too much emotion towards my greatest fear. I know all the self doubts that I have come from Satan. And with the help of God I can make it through the temptations to give in to the self doubts. But it still rips me up inside. My one desire in life, after following God with all my heart, is to be a wife and a mother. Maybe God is leading these people in my life to say those things to me as a way of reassuring me that yes, someday it will happen. I can only pray that that is true. But you see, I had (still have) a plan. Married by 24, children by 27/28, then married/family life from that point on. And still, as I have passed those planned ages of having accomplished life marks, I mentally still plan. Well, if I met a guy tomorrow, we’ll date for a year or so, engaged for a year, married (now I’ll be pushing 30), well, can’t wait now too long for kids so instead of 4 years of just being married and enjoying ourselves having fun and traveling we’ll knock it down to 2. That’s the kind of dialog that goes on in my head. I am a planner and an analyzer. Hence the problem, how do you accept a compliment about being a nurturing, gentle hearted great mother of the some days in the future…? 1. Not step foot in Target for the WHOLE month. I shop there way too much, a lot of times just because I’m bored. And I don’t walk out of there without buying something and spending at least $30, once or twice a week! It’s time to take a break and see if I come out ahead and not in the negative. Honestly, I can get the basics that I need at the grocery store. 2. Lose 5 pounds. Last month I lost 6.4. So this is totally doable. 3. Take a day trip somewhere. Monterey was January, maybe Sacramento or San Francisco for this month. 4. Not mope on the dreaded Valentine’s Day because I don’t have a Valentine. But rather rejoice because God has good things planned for my life and each new day is a day closer to meeting my future mate. 5. Take my mom out to lunch. 6. Heavily pursue finding a new job. 7. Actively seek God in my day to day life worshiping Him and bring Him glory. What are some resolutions that others have? So this past Saturday I went to Monterey for the day with a good friend, Stacey. This trip was two fold, celebrating my Stacey’s birthday, and visiting my brother who attends CSU Monterey Bay. The day was great. Stop at the campus to see where my brother is living and pick him up. Headed to Cannery Row. Ate some grub at Bubba Gump’s. Walked around a bit. Went to the Monterey Bay Aquarium and checked out all the sea creatures. Walked around a bit some more, this time it was raining a little. Got some salt water taffy… Yummm…. Drove to Carmel and ate at Forge in the Forest. Everyone had a great time. It was sad to have to leave the beautiful coast. But it’s comforting knowing that it’s only a 2 hour drive away. I’ve attached a few photos of the day (by the way, if you haven’t figured it out I love pictures). Chris, Stacey and I at Bubba Gump’s. Otter primping for the webcam and his audience. Stacey and I with part of the aquarium behind us. Squishy! Did you know the jellyfish is 95% water? Awwww…. Stacey “hatched” into the family. For now I think I’ll just leave you with a picture of the puppies my dog had 6 weeks ago. She only had two, which is plenty for the breed. Any more and we’d have a house full of terrors. And both puppies are going to stay in the family. My parents are going to keep the male, Monty, and I’m going to keep the female, Izzie, for companionship to my dog (and their mama), Riley. These puppies are full of piss and vinegar, let me tell you, they are a credit to their breed. But they are so stinking cute! They actually had their first set of shots today, poor little things. Well, That’s about all I’ve got for you for now.